Your text is vey well written. Your vocabulary is on a high level. Your reflections on these difficult and serious issues are sincere and important. There are only a few mistakes. Very good. Values are important ideas or beliefs often shared by a group of people; what is right and what is wrong? Our values are often shown when we're answering ethical questions, and they have a huge influence on our way of living, by affecting both our attitude and our behavior; and even the way we're looking at life. 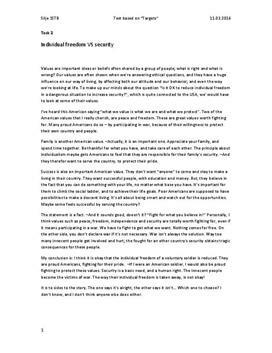 To make up our minds about the question “Is it OK to reduce individual freedom in a dangerous situation to increase security?”, which is quite connected to the USA, we' would have to look at some of their values.